The famed Yellow Vest movement of France—along with numerous other nations worldwide—has been ongoing for several months now. This uprising and demonstration has stemmed from the growing amount of unrest caused by an artificial socioeconomic, corporate, and global order (or as we know it, globalism) which disregards the rights of the general public in the name of an idealized "greater good." In reality, this same NWO which has, for years, systemically forced itself onto the general public—bathing the media with self-justifying propaganda—while punishing all of those who did not acquiesce to its demands. In the name of this distorted form of anti-human "progressivism," this NWO has used fallacious appeals to emotion to introduce provably unhealthy and destructive standards of living onto society. As good-intentioned and yet suggestible citizens accept these loaded standards as norms, these citizens unknowingly sacrifice their right to disagree with the orders of this totalitarian global order. However, even as supposedly powerful as this NWO was thought to be, humanity is rising up to overthrow the fictitiously superior world order to demand freedom and respect. Falling directly in line with nearly every other historical uprising of the people against a fascist, totalitarian establishment, the Yellow Vest movement has catalyzed the public to rise up and demand to be respected as human beings. The yellow vests worn by these demonstrators symbolizes their overall message. That being, "We matter. We are human beings trying to make a living. Open your eyes and stop ignoring us," or more simply, "Don't run us over." These activists wear these symbols of safety and acknowledgment because they are tired of being forgotten by an establishment that places the greed of a handful of international corporate powers over actual humanity and the needs of the people. A new spirit of nationalism is being reinvigorated among numerous countries, and this is not the nationalism which the corporate media has portrayed it to be. While the MSM attempts to paint everyone who stands up for themselves in modern times as a "Nazi/racist/homophobe/xenophobe," the obvious reality is that self-defense and the demand for acknowledgement do not equate to hate or bigotry in any way. In fact, the Yellow Vests—as we examine the core of their message—are reminding the world that this self-defense is not only a foundational right, but it is the core reason why the world has been able to rise out of the fascist, totalitarian, and anti-human regimes of the past. Below is a video from the YouTube channel, We Are Change. This source has been diligently reporting the quickening progress of freedom-fighters on a global scale. 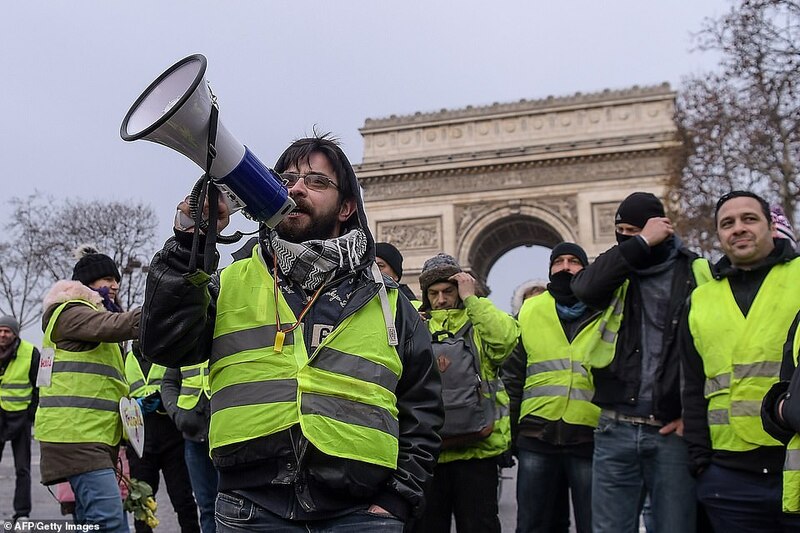 Within this report, they offer an interesting perspective into the Yellow Vest movement. The lie pushed by the NWO/Globalist regime is that infinite immigration has no negative outcome and that anyone who argues against this infinite influx of third-world immigrants is a horrible person by default. However, history shows us that such reckless disregard for national borders often precedes the final stage of societal collapse. If they are intelligent at all, the globalists know this and this is the likely reason why they want endless immigration. Just as any vessel, any given society will have a limited growth capacity in order to remain functional and balanced. In some cases, societies will have a limited capacity entirely. Socialist and communist regimes, for instance, actually have extremely limited capacities because they require an equal contribution from all (that's all) citizens in order to maintain minimal functionality. So when we see various politicians pushing for limitless immigration along with socialist or communist standards, we will know the likely goal behind these policies. It doesn't require much thought to realize what happens when a limitless input is applied to a system with limited capacity. There is obviously negative outcome waiting for any nation that gives into the endless propaganda via appeal to ridicule and appeal to emotion at the expense of reason. By all appearances, globalists are disinterested in putting up with self-respecting freedom-loving citizens any longer (which would explain Macron's disregard for the citizens' demands), and are only interested in dealing with impoverished third-world immigrants who are more willing to endure the abuse the globalists will most certainly impose upon them once the freedom-loving population is completely eliminated and replaced. The people are wise to this plan, and fortunately for us, they are not putting up with it any longer. Third world countries may need the assistance of the West to repair the damage done to their countries over the last few decades due to the pointless wars of western corporations. However, this problem is obviously not solved by placing the punishment of these wars on Western citizens who had no part in waging those wars. 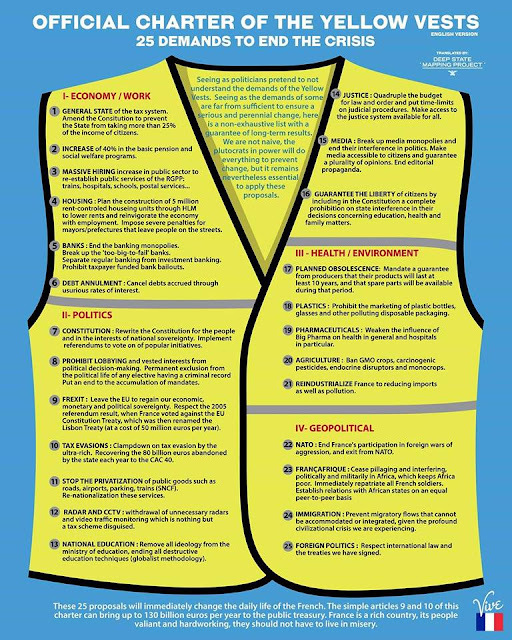 For these reasons, the Yellow Vest movement is needed. These activists represent the mobilization of the people who are no longer interested in allowing the greed of corporate and globalist manipulators to wreck the planet or the societies thereupon anymore than these criminal interests already have.